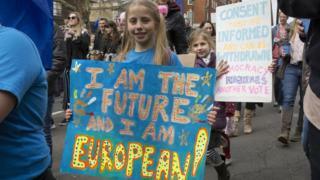 About a million people took part in Saturday's protest in London demanding a referendum on the UK's Brexit deal. That's according to reports from the march's organisers, the "Put It To The People" campaign. The protestors are calling for the final deal, setting out the circumstances under which the UK would leave the European Union (EU), to be put to the people. 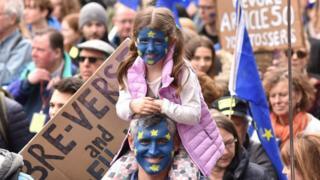 Crowds waving flags and carrying placards were told the initial count showed more than a million people had turned up - which would make it one of the largest marches in the UK this century. 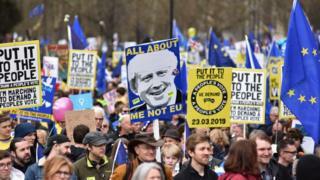 BBC correspondent Richard Lister, who was there, reported: "The organisers say it was one million-strong, it's very hard to verify those kinds of claims but this was a very significant march, well into the hundreds of thousands." The event was planned for this date because it was six days before 29 March - the date the UK was due to leave the group of countries called the EU. However EU leaders have now agreed that the UK can delay Brexit, subject to certain conditions. If the deal is approved, the EU has agreed to extend the Brexit deadline until 22 May. But Mrs May has apparently told MPs she might not hold this third vote at all, if she doesn't feel there is enough support for it to pass. 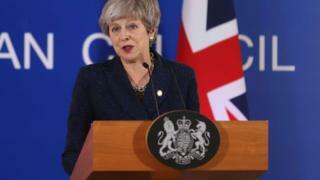 There are reports that some members of the Conservative Party, which Theresa May leads, have told the Prime Minister she must promise to stand down as PM in a bid to gain support for her Brexit deal. But No 10 has dismissed reports that Mrs May could be persuaded to stand aside. Another Brexit-related protest is also heading to London, having started in Sunderland a week ago. It's led by former UKIP leader Nigel Farage, who has long called for the UK to leave the EU and was a key pro-Brexit figure during the referendum campaign. 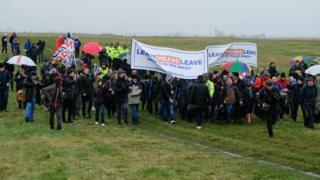 The Leave Means Leave campaign was organised in protest at a what supporters say is a "betrayal" by the government when it comes to Brexit. Speaking to around 200 Brexit supporters, Mr Farage said that Mrs May had reduced the nation "to a state of humiliation", and that those gathering for the People's Vote march in London were not the majority. Meanwhile other members of the public are pushing for the government to revoke - or cancel - Article 50 as a way to stop the UK from the leaving the EU without a deal. Article 50 is the name of the legal process by which the UK will leave the EU. More than 4 million people have signed a petition calling for Brexit to be cancelled, with UK government's petition platform having crashed several times because of the level of internet traffic to the site. 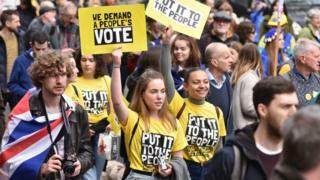 The petitions committee said: "Between 80,000 and 100,000 people have been simultaneously viewing the petition to revoke article 50. Nearly 2,000 signatures are being completed every minute." What is Article 50? And why are people talking about it? Brexit is just a big problem that we created and can't find a way to solve it. I agree with cupcakerainbowcat. They shouldn't have started Brexit in the first place. All this time spent on this silly Brexit could of been spent tackling something else like homelessness or hunger. Brexit is confusing but I know that its causing a lot of trouble. I don't like Brexit. It's too confusing and it's too much of a hassle. If we keep holding referendums then it''s like repeating a match of Rock Paper Scissors until we win. I agree to, but again this is just my opinion.